The basis for the collaboration of the different groups involved in the design of the iCub platform and its extensions (e.g. the iKart holonomic mobile base) is the definition of common rules and tools for the design itself. The present document defines the standard for the documentation of mechanical hardware components and assemblies. For proper repository maintenance people committing files to the repository shall act in accordance with the following guidelines. This section describes the coding standard to be used in the design and development for the current project. The use of the coding standard for each document shared in the community is mandatory to keep the traceability of the file. The same coding is also recommended as internal standard for each group involved in the iCub mechanical platform documentation. The coding procedure assigns an alphanumeric code to each file produced in the design process from part files to assembly drawings. The same coding standard should also be used for the written documentation (eg. calculation report). The fields in the code are described hereinafter. Note: Space characters are not allowed in file names; use the underscore character “_” instead. Note: Although not mandatory it is preferred to avoid codes with the same GROUP_LETTER_NUMBER and different ISSUER. The CAD documentation shall be produced and maintained with PTC Creo Parametric 2.0 (the follower of proE in the family of parametric 3D modelers. The standard part for the iCub documentation is named “rc_start_part_wf4.prt”. This part must be used as the base for creating new ones (using the “Save as…” or the “New” file options commands). This file can be found in the “mechanics\config\standard_files” folder. For common reference the standard part is the same for the entire consortium and must not be modified. The parameters defined in each part file are listed below. The parameters highlighted in GREEN are filled by the user. TREATMENT:the treatment that will be applied to the part. MATERIAL:the material assigned to the part. This parameter is filled in using the Pro/E command sequence Setup > Material > Assign. Important - The description and sub-description fields are used for the preparation of the project BOM. It is of the utmost importance that the fields are filled properly and with meaningful content. are filled by the system at the first regeneration of the part with the values found in the start part. 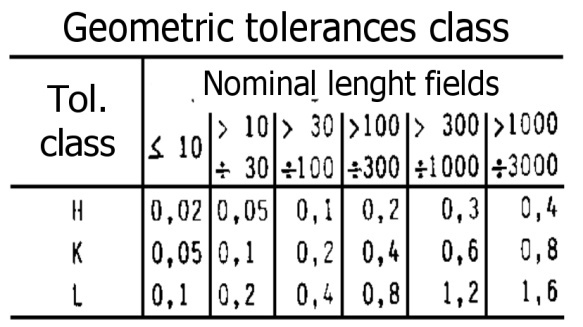 Note: The parameter TIPO defines the part category. This information is used in the production phase to sort out items depending on how they are to be acquired. By default it is left blank and is later filled by IIT staff members. MASS is directly dependent for the MATERIAL parameter (using the density value reported in the material file). When designing it is often necessary to mirror parts or assemblies. Special care shall be taken in these cases. Important – After mirroring models update the model description accordingly (e.g. if the description contains the string “left” change it to “right” and viceversa). Important – Special care shall be taken when revising a mirrored part. If features need to be added to the model tree this shall be done by mirroring the base part and not by adding features directly in the mirrored model. The standard assembly the iCub documentation is named “rc_start_asm_wf4.asm”. This file must be used for creating new assemblies (using the “Save as…” or the “New” file options commands). This file can be found in the “mechanics\config\standard_files” folder. As for the standard part for common reference the standard assembly is the same for the entire consortium and must not be modified. 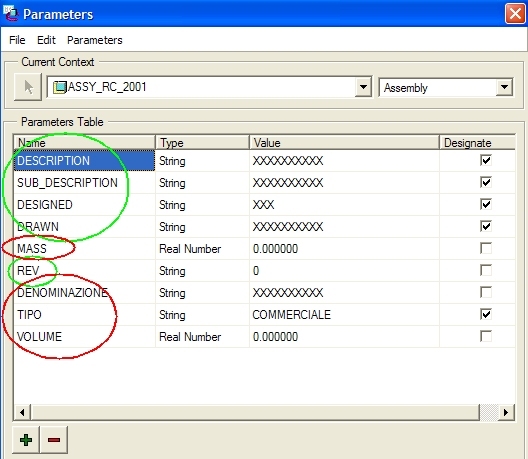 The parameters defined in each assembly file are listed below. As described before, the parameters highlighted in GREEN are defined by the user. The RED ones are defined by the system at the first regeneration. Note: MASS parameter is automatically calculated by the system as a sum of all the parts mounted in the given assembly at every regeneration of the model. Important - To avoid the duplication of database entries before adding commercial components to assemblies it is mandatory to check that the given component is new, and has not been used so far. This is to be done by checking the commercial folder. Important - Whenever possible use family table commercial components. Adding a new component which is already represented in a family table shall be done by editing the family table. This is mandatory to avoid part duplication. Parts and assemblies shall be revised according to the revision management protocol. The revision index is an alphanumeric code composed by a capital letter (A-Z) and a natural number from 1 to 9. A1, A2, A3, ..., A9, B1, B2, ... etc. Important – The revision index shall be compiled in the part or assembly parameters as this parameter is dynamically linked by the drawings. Whenever a part is modified special care shall be taken in order to properly track the evolution of the design. Important – If the part is backwards compatible (i.e. if it can be directly replaced in the assembly that contains it) the revision index shall be incremented. Important – After revising a part its drawing shall also be revised as described in section Revision Tables. Whenever an assembly is modified its revision index shall be incremented. It is in general preferred to avoid assigning new assembly codes, unless the changes in the assembly are very significant. 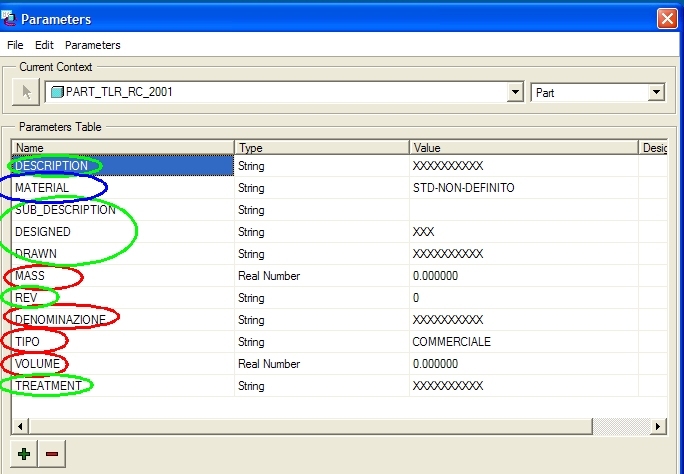 When the user inserts a format in the drawing, automatically the system requires the TYPE of all the parameter which aren’t in the reference part (that is to say: UNDIM. ROUNDS, UNDIM CHAMFERS, CHECKED, APPROVED, REV., MOUNTED_ON_ASM, TOL_DIM_CLASS, TL_GEOM_CLASS). For all the parameter the type is “STRING”. After the type definition, the user has to fill the parameter value for every parameter requested. Note: parameters can be easily modified with the “Edit > Value” command. Note: these values have to be written in LOWER case. Note: these values have to be written in UPPER case. In any case the symbol must be completed before its insertion with the “Var text” value. For roughness symbol in the drawing, the Pro/ENGINEER standard symbol (“isosurftext.sym”) in the “System Sym” directory should be used. It’s the same table of mechanical drawing, without the last 4 rows. The same instructions apply. 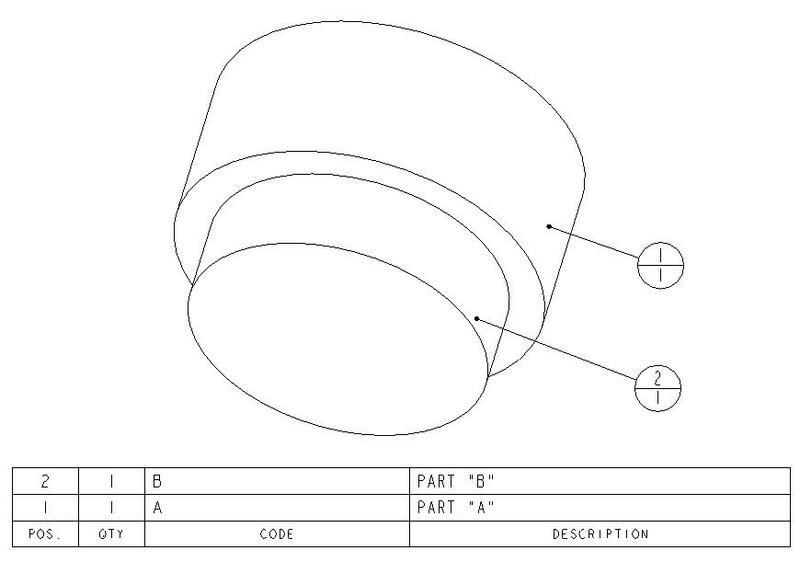 In case of assembly drawing, it might be necessary the insertion of a BOM (Bill Of Material) table. The “BOM_table” file can be used. This table will be automatically filled by the system, reading information reported in parts (or sub-assemblies) parameters. “with qty” BOM balloon type can be used. Rev3_table: for the third revision on the document. The same instruction must be followed in case of second or third revision (the table with the previous revision has to be deleted). This page was last edited on 26 June 2013, at 16:09.